The game is telling the story of Andrew Winter, an alcoholic living in a small cabin near the woods. He keeps having nightmares about an abandoned place that seems familiar to him. You have to reveal the dark secrets that are hiding in the abandoned mansion on top of the hill in Blackdust Field. Are you able to find out the truth hiding in the deepest insides of the house? 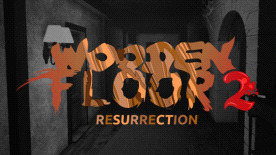 "Wooden Floor 2 - Resurrection" is the sequel to Wooden Floor, telling the other side of the story and completing the puzzle. Big improvements to graphics and gameplay!